These cute doodled hearts are made out of paper clay, which is basically a mixture of toilet paper, glue and joint compound. Who knew such cute things could be made out of such thrifty products? This paper craft project is cheap to make, but with a lot of patience and elbow grease, can look absolutely stunning. The best paper mache clay recipe can be found on ultimatepapermache.com . This recipe is the invention of Joni Good, a paper mache artist who owns the site. What started as a simple experiment to get a smoother paper mache surface has turned into a world wide phenomenon. It is the best recipe ever, and can be made at home in less than 15 minutes! Make a batch of Air Dry Paper Mache Clay. You can find the recipe here. Trace the inside of the heart cookie cutter onto a leftover piece of card stock. Cut the heart shape out with scissors. Place the cookie cutter on a sheet of wax paper. Fill the cookie cutter about 1/4 inch with paper mache clay. Press down with fingers to ensure the entire cookie cutter is filled. Place a card stock paper heart cutout on top of the paper clay and press down evenly with fingers. The paper card stock helps to get a smoother finish on the paper mache clay heart. 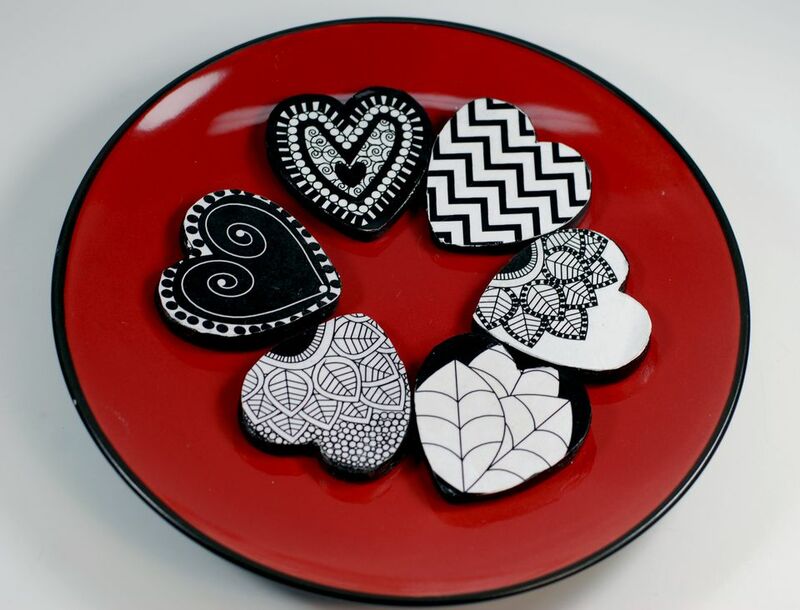 Remove the cookie cutter with an upward motion carefully from the paper mache clay heart insert. Leave the paper mache heart on the wax paper. It will take about 3 days for the heart to be totally dry. When the heart is dry, remove the paper heart cutout from the paper mache heart. Using a sanding block or sand paper gently sand off any rough edges. Apply a thin layer of joint compound on the top and sides of the paper clay heart. Allow the joint compound to dry completely. This may take a couple of hours. Apply joint compound to the bottom of the heart and allow it to dry completely. Using a coarse sanding block or sand paper, sand the top, bottom and sides of the heart until you have a smooth surface. The heart will now look as if it is made of stone rather than paper mache. Awesome! Spray and seal the top and sides of the paper mache clay heart with Kilz Odorless Spray Primer. Spray and seal the bottom of the paper mache clay heart with Kilz Odorless Spray Primer. You now have to decide how you wish to proceed. The heart can be painted, decoupaged with paper, or simply be left as is. I chose to trace the shape of the heart and then scan it into my digital imaging software. I have a problem drawing neatly so I drew the doodles in Adobe Illustrator, printed the hearts out and then cut and glued the printed paper hearts onto the paper mache hearts. To give the hearts a finished look, I then painted the edges black with acrylic paint. If you draw well, just trace the hearts onto a white sheet of paper and using a micron pen or fine tipped black marker to draw whatever doodle you want onto the heart. You can also decoupage the paper mache heart with tissue paper or any type of colorful paper. Spray the top and sides of the paper mache clay heart with a glossy polyurethane spray. Spray the bottom of the heart with a glossy polyurethane spray. * Optional Instead of using glossy polyurethane spray Plaid Dimensional Magic also works well to give the paper mache hearts a glossy surface with a bit of added dimension.